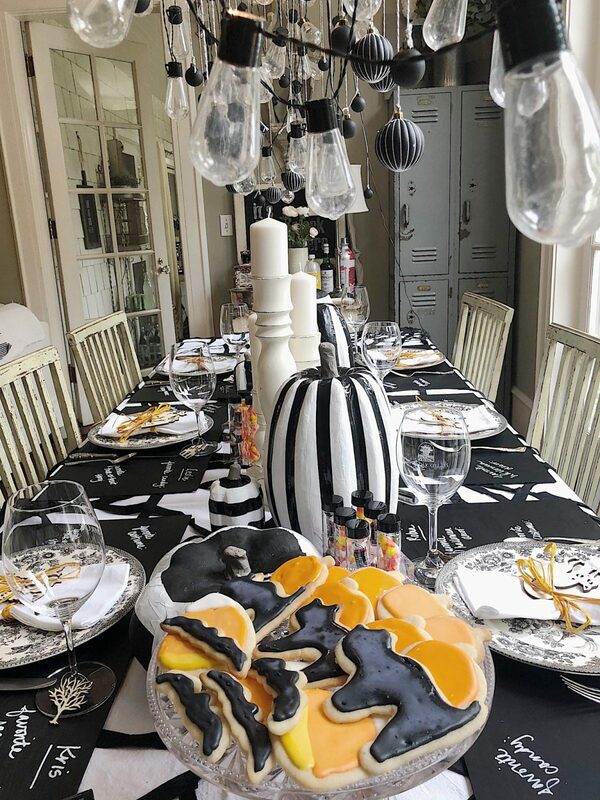 Making Halloween table decorations was so much fun. 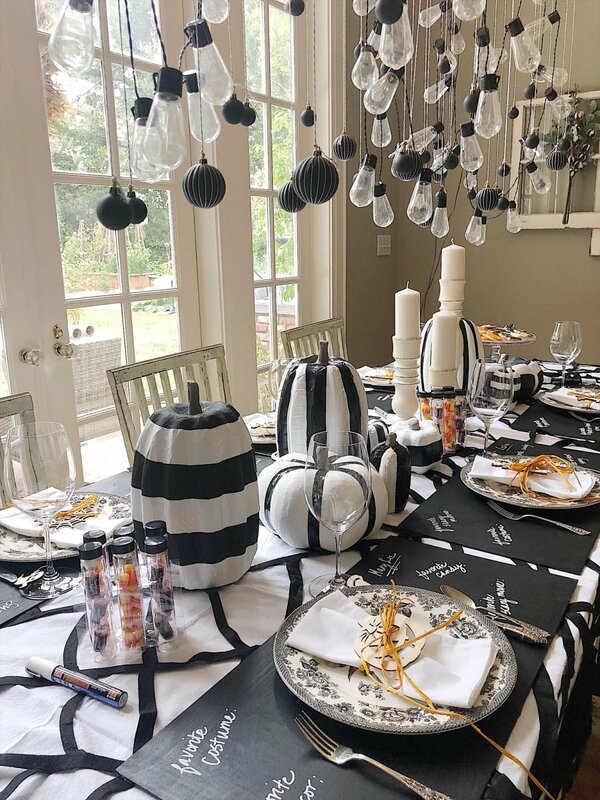 I can’t even begin to tell you how great it was to create a table in a black and white theme! 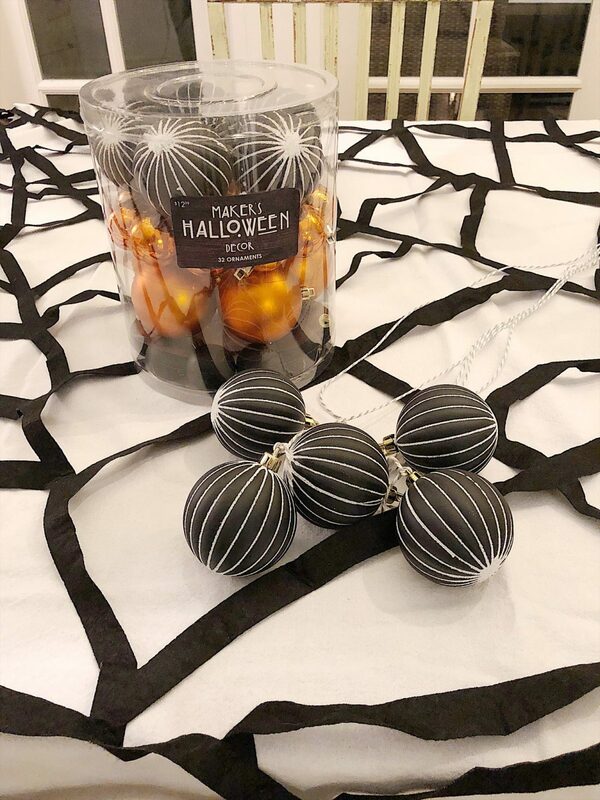 All of the Halloween decor and craft items for my DIY’s are from JOANN. Every single project is easy (I promise!). The pumpkins are made with paint and duck tape. 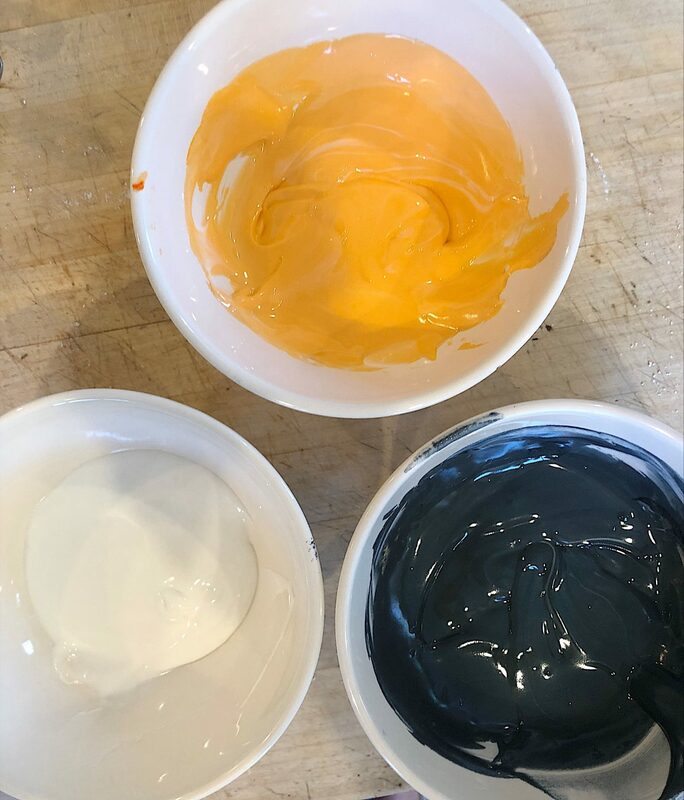 The chargers are wood painted with chalkboard paint. 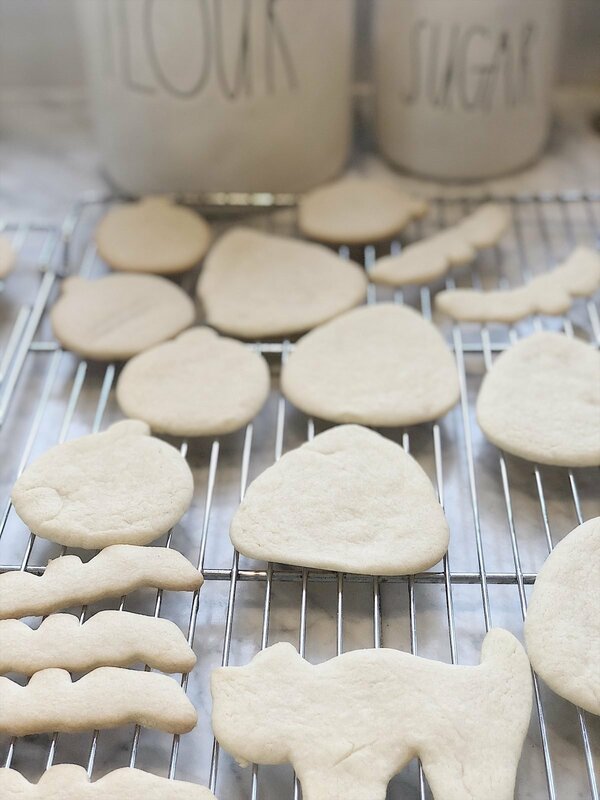 The cookies are a basic sugar cookie and royal icing recipe. And all of the decor was purchased with coupons at JOANN. 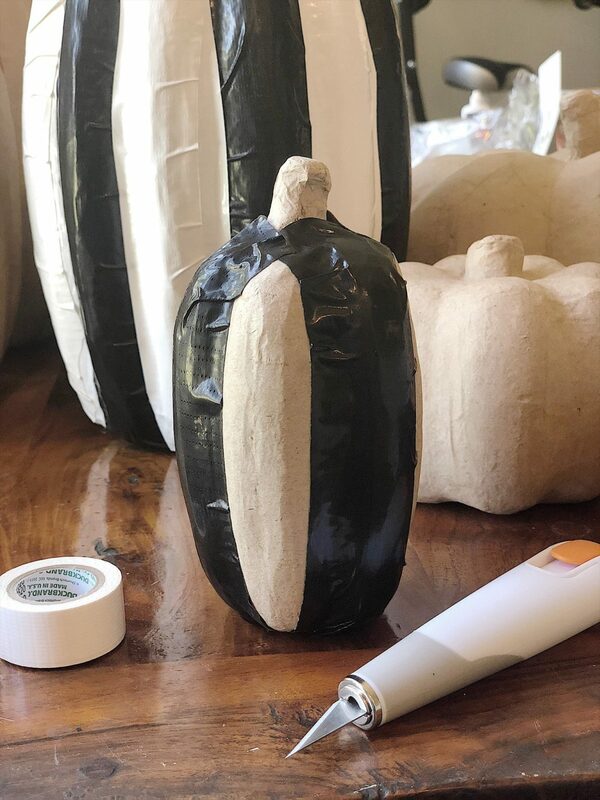 I can’t even begin to tell you how much I love my duck tape pumpkins. 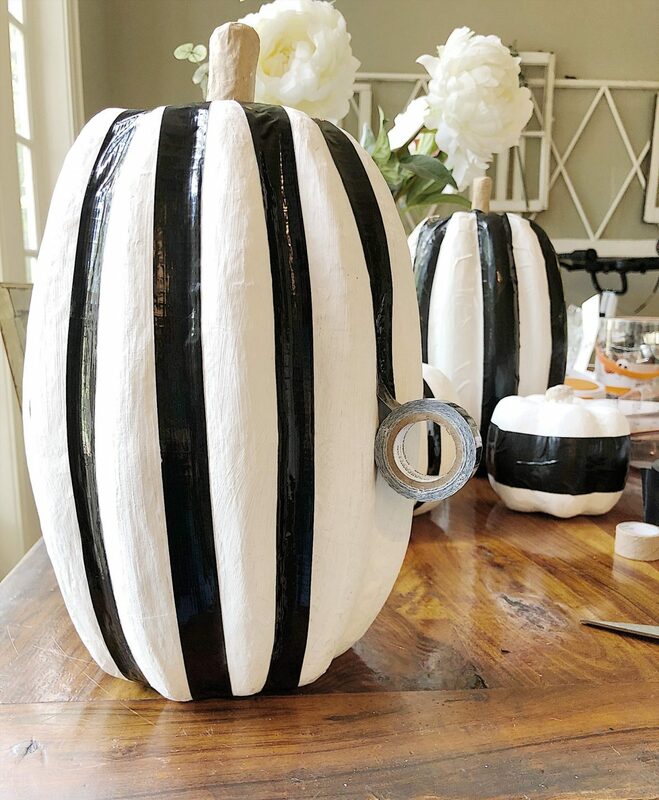 The complete tutorial to make these duck tape pumpkins can be found on the JOANN app. But here are a few photos to show you how easy they are to make. I used paper mache short pumpkins, tall pumpkins, and small pumpkins. I also used thin and thick widths of duck tape in black and white. 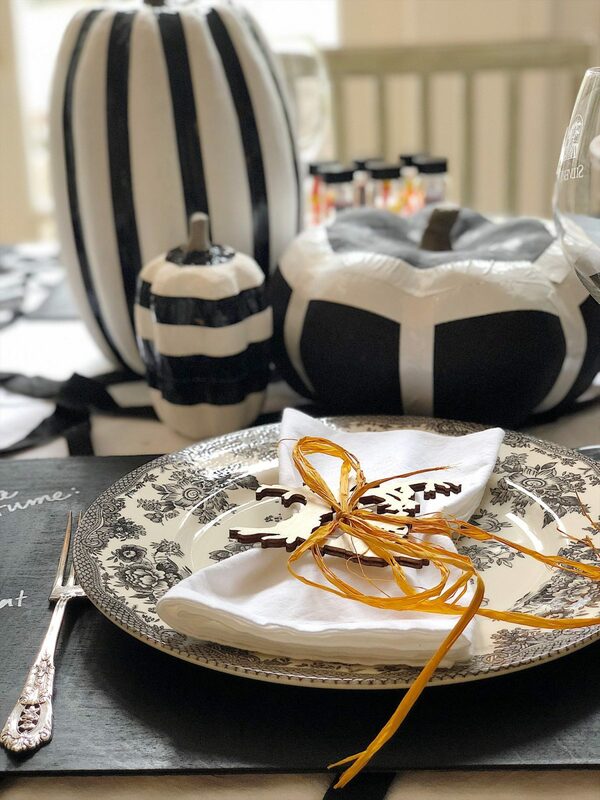 I also painted some of the pumpkins with chalk paint and used duck tape to create the accents. The most important tool I used to make these was my Fiskars craft knife. It was really helpful to cut the tape. I also made my own charger plates. 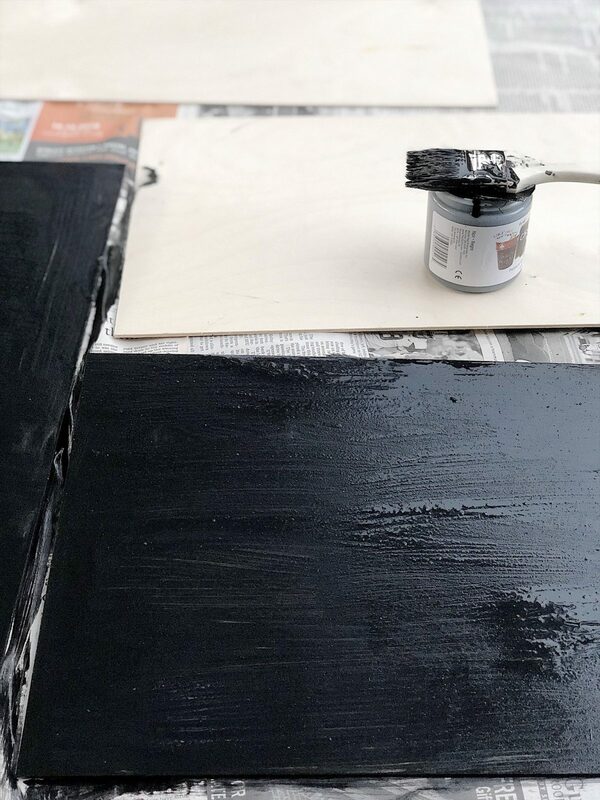 I bought six rectangle wood pieces and painted them with chalkboard paint. 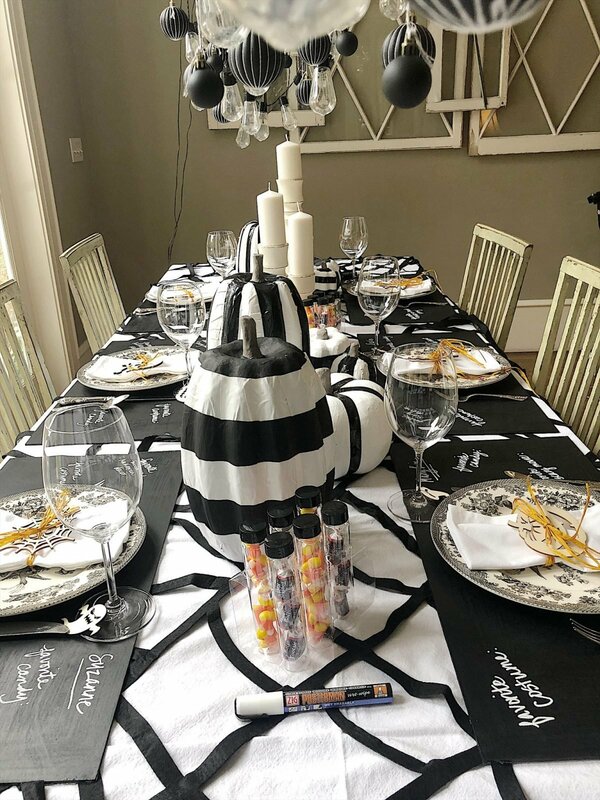 I thought it would be fun to use the chargers to write the names for “placecards” and add some “Halloween Favorites” so that each person could share their answers during dinner. 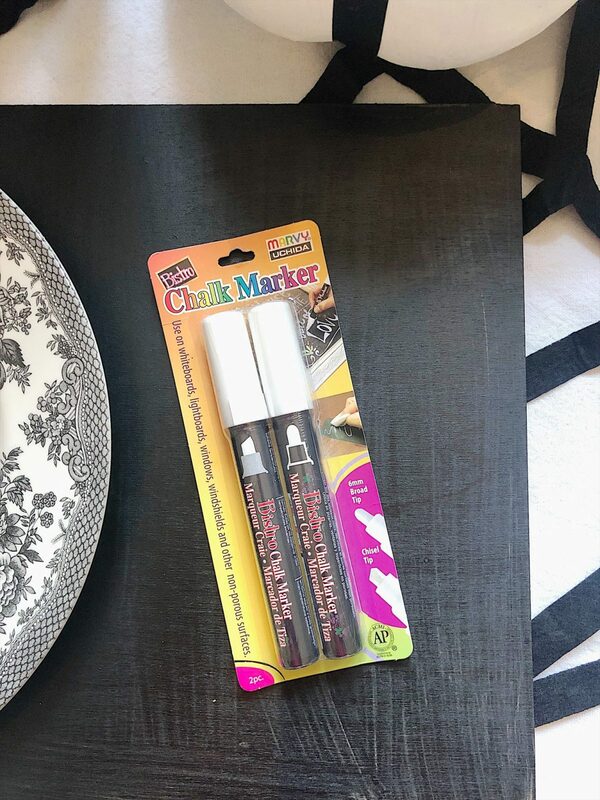 These chalk markers were perfect to write with. These were so easy to make and I will use them again for sure! Do you know the best thing to use to clean a chalkboard? A Mr. Clean magic eraser! I purchased some wood cutouts to make my own napkin rings. There are so many cute Halloween cutouts. The raffia was left over from last month! 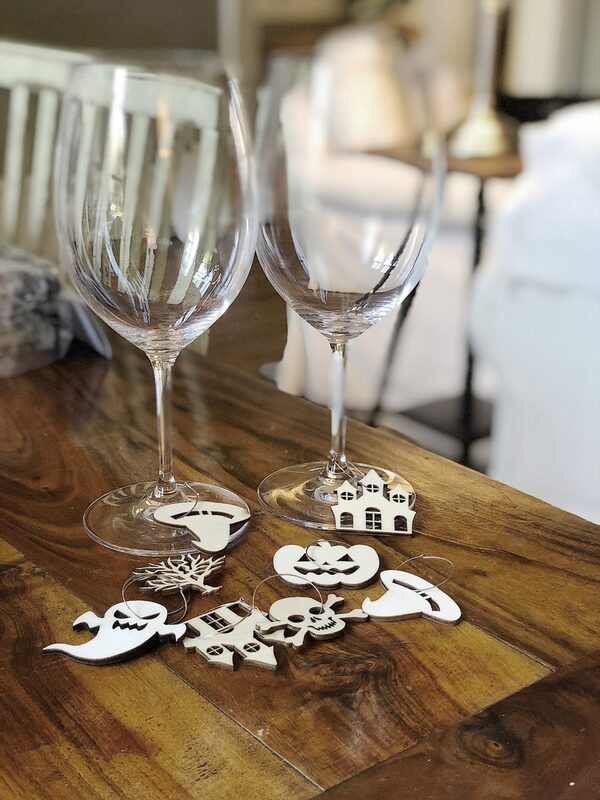 I also bought the smaller wood cutouts and some earring hoops to make wine glass charms. Aren’t these adorable? 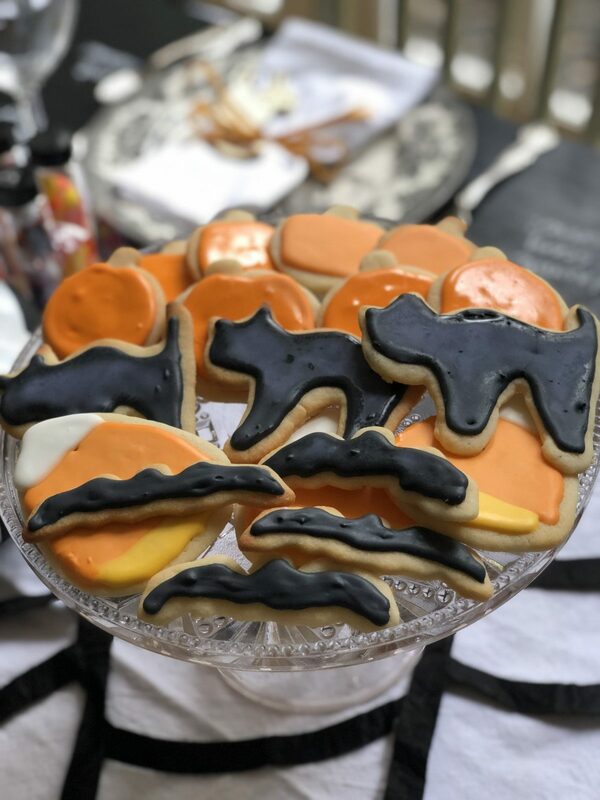 I also wanted to make a Halloween dessert and I decided to make Sugar Cookies with Royal Icing. 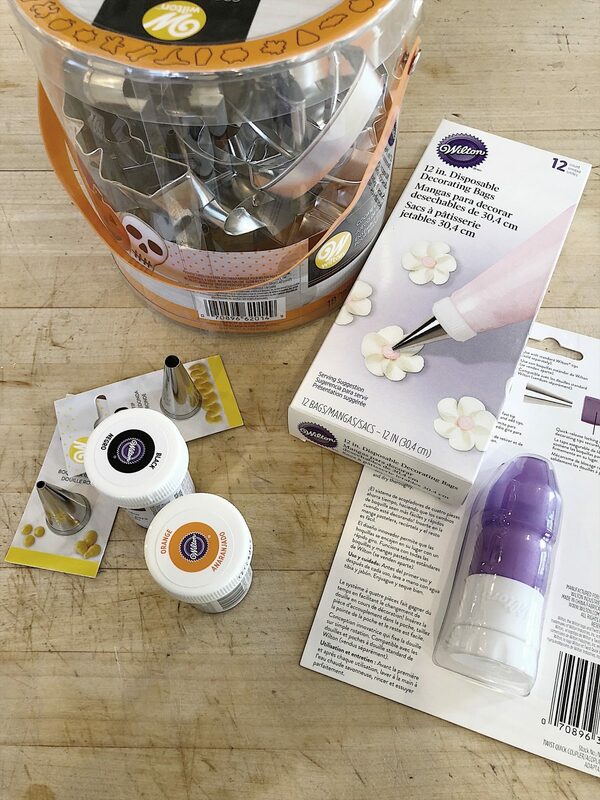 I found some great cookie cutters and some cake decorating tips, icing bags, coupler, and coloring. 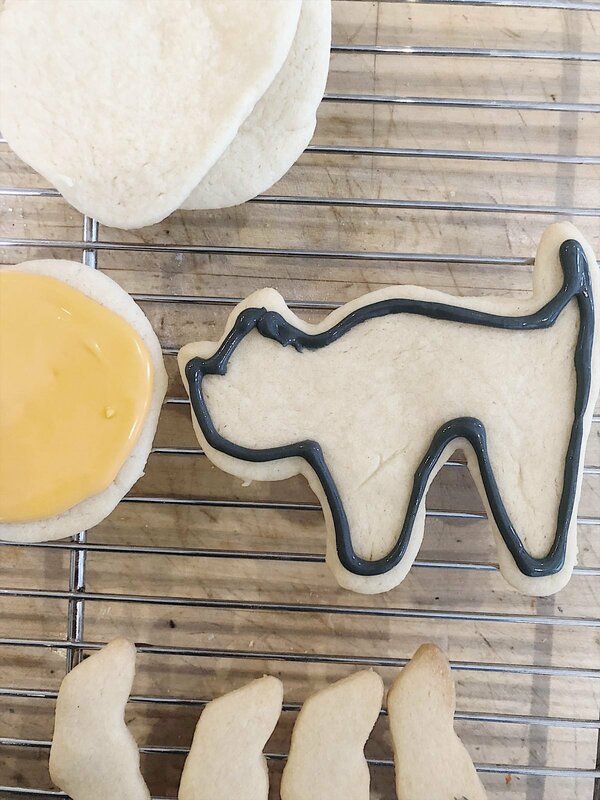 I make sugar cookies all of the time. But my decorating usually consists of spreading buttercream frosting on the cookie. I decided it was time I tried to frost them with Royal Icing. First I made the sugar cookies. 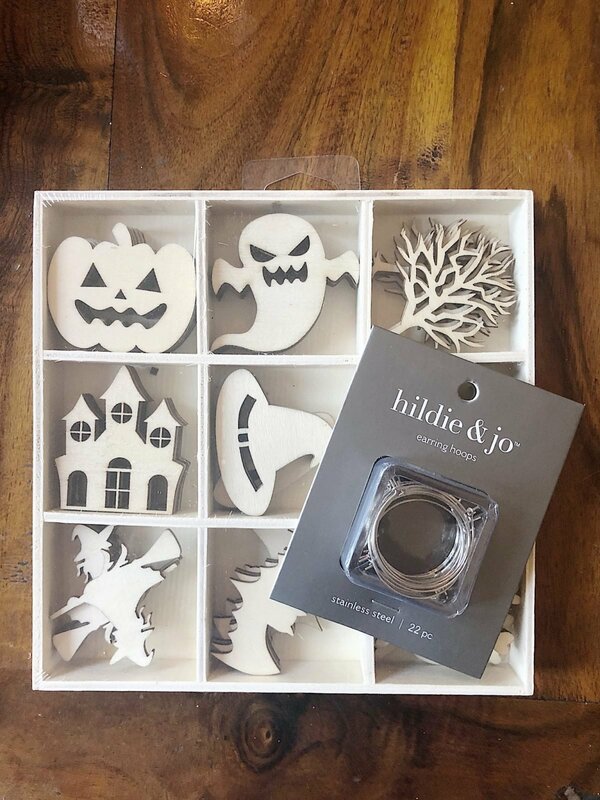 This set includes Halloween and also fall cookie cutter shapes. I chose pumpkins, bats, cats, and candy corn shapes. Then I made the Royal Icing. It is a lot thinner than buttercream frosting but it works very well. The first thing you do is outline the cookie with frosting. Then you fill inside the outline with frosting and shake the cookie so that it fills in evenly. I know these aren’t perfect but I love how they came out. I think the frosting was a bit too thick. I am sure they will look better on my next attempt! About a year ago I hung a vintage ladder above our family room dining table and hung three white wood chandeliers. This gave me a perfect way to hang some fun lights and ornaments. The first thing I did was hang the lights. I used one of my white tablecloths on the table. I found two large spider webs and placed them on top of the tablecloth. They fit perfectly! Then I added my white wood candlesticks. I bought three boxes of Halloween ornaments. I decided to only use the black ones. I tied a 45″ piece of string to each ornament. And then I hung the ornaments from the ladder too. 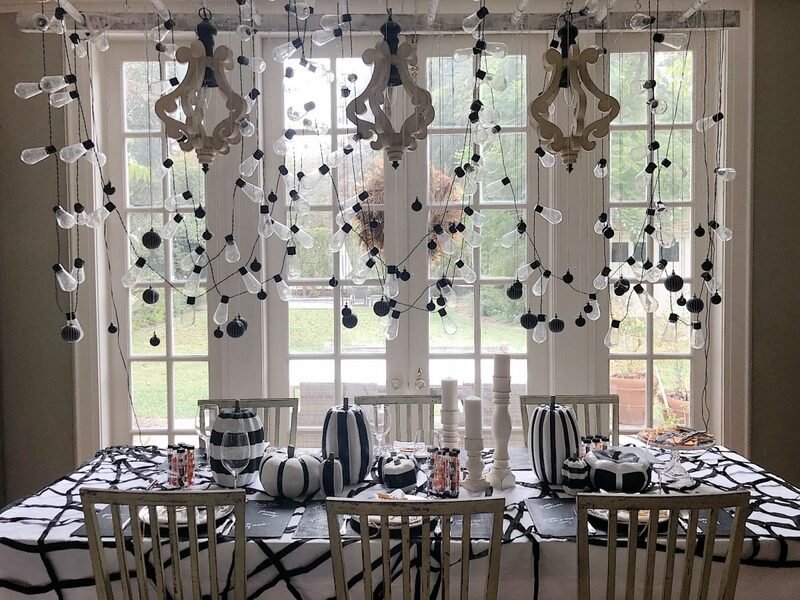 Next, I placed my black and white pumpkins on the table as my centerpiece. 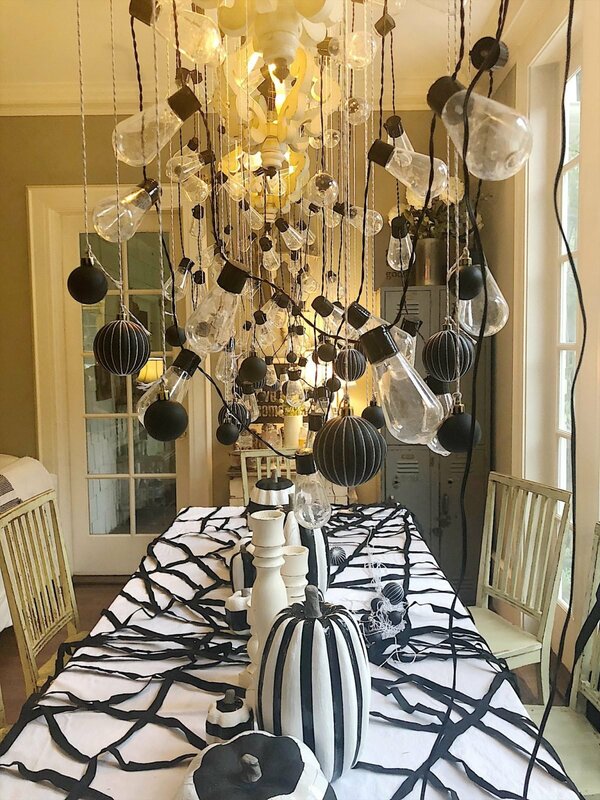 I set the table with the chargers. 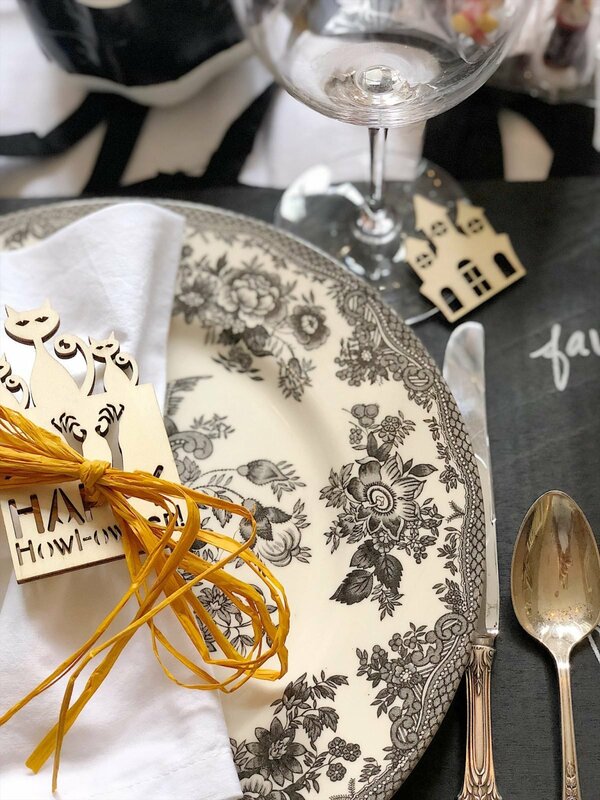 I used my vintage black and white china plates and my sterling silver. 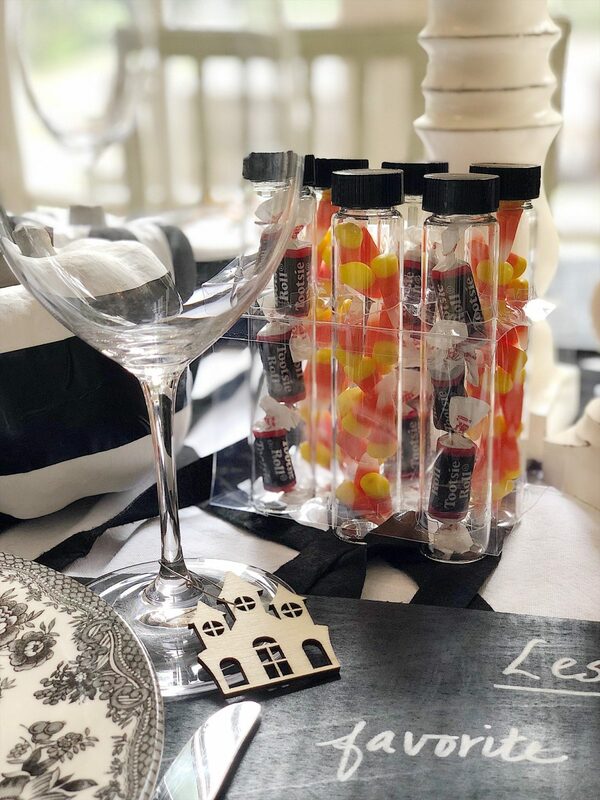 They are my favorite and I can’t believe how great they look with this fun decor! The orange raffia was left over from the fabric pumpkins I made last month. 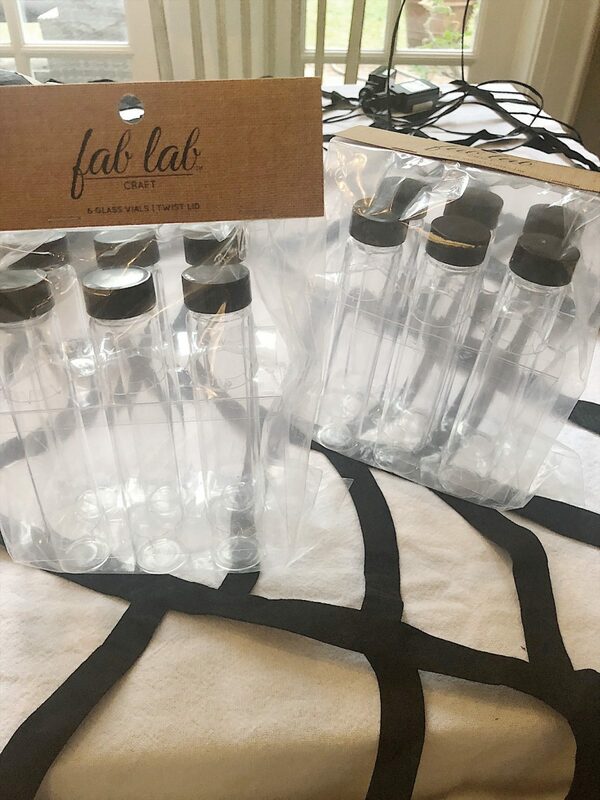 I also bought some Fab Lab craft vials. Originally I was going to also hang them from the ladder but I decided they would look better on the table. So I filled them with candy and placed them on the table. The table is finished. Can I just tell you how much I love my Halloween Table Decorations? I am thinking this will be a new Halloween tradition in our home! Love it!!! It is funny, like you, I never did much with the table for Halloween when my children were young either. I always just did a fall display on it. Probably, I was too busy doing costumes and classroom parties as a room mom(it is all a blur now). Now is our time to shine right??? Please take a pic of the table at night and post it. This is awesome!! I too have never really done Halloween decor around our home. You would guess that with our two little boys and me being a Halloween baby, I would!!! But, slowly and surely, this year I have started buying skeletons and such to decorate our home for some spooky memories!! Thanks again for all the tips!! Love it!! P.S. yes, please post some evening pictures of this gorgeous table!! Wow the table and decor turned out amazing! 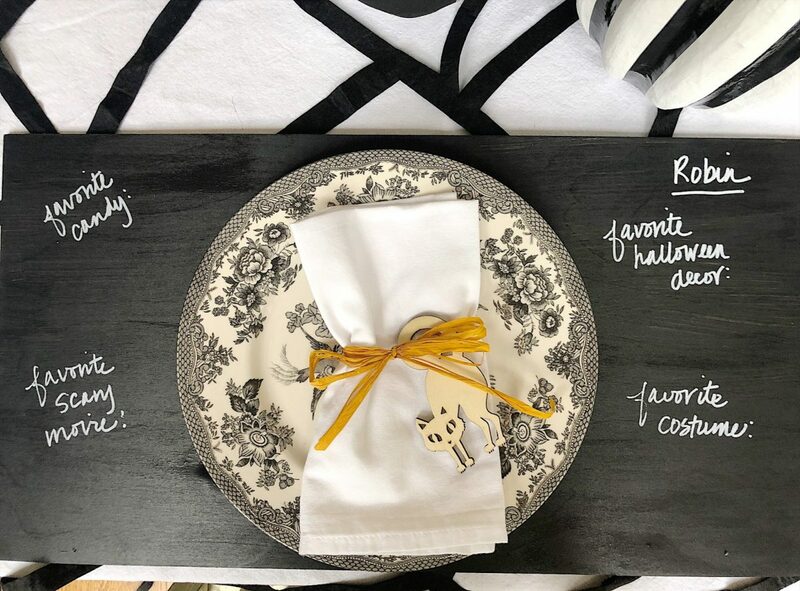 I love all of your DIY ideas because they are doable. 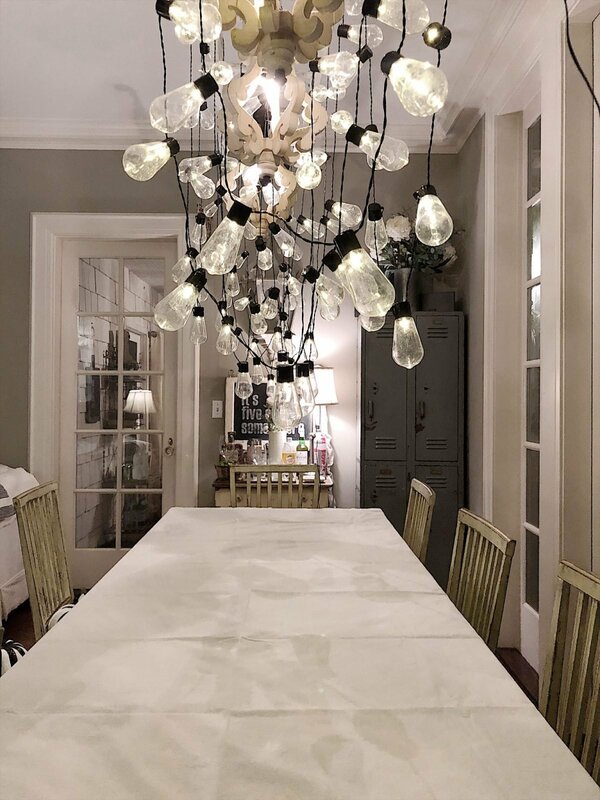 Have fun at your dinner party and take more pics of it all lit up! Those hanging lights are perfection!! You blew it out of the park! And such great DIY elements to this look. I can’t believe what I am seeing. You are amazing! Love it! 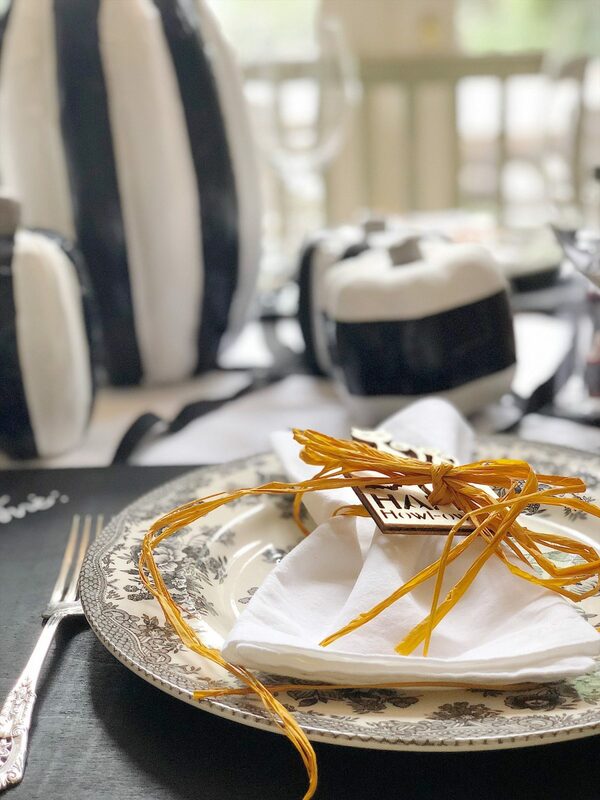 Your table decoration is just stunning, great job! party questions ahhh I love that!!! Oh wow Leslie, its all so incredible!